Grapes that are “international” often have different names in different countries. Take Syrah vs. Shiraz, Grenache vs. Garnacha, and of course, Pinot Gris vs. Pinot Grigio. Not only to the different names represent a different language, but typically a different style as well. This is the case with Pinot Gris and Pinot Grigio. A French vine variety, Pinot Gris is best known for the soft, aromatic wines it produces in Alsace, France. Pinot Grigio, the Italian name for the grape, can produce wines of equal aromatics, but high production of the grape in some areas of Italy has led to wines that are less aromatic, more citrus-driven and lighter-bodied. 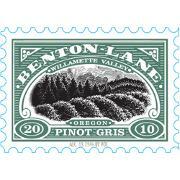 Oregon is one of those places that adopted the name and style of “Pinot Gris.” Actually, it’s against the law in Oregon to name it anything else. And true to name and style, the Pinot Gris of Oregon mirrors the same aromatic intensity and rich texture of the wines of Alsace. And yet, they certainly can hold their own as well. Previous PostZinfandel. A HistoryNext PostRosé goes mainstream!